Located amidst verdant rice paddies, NEFATARI consists of nine villas, five single units and four family villas. 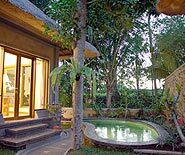 The villas are constructed in traditional Balinese design using indigenous materials such as stone, teakwood, camphor wood and bamboo. Each villa is finished with a naturally insulating, fragrant Balinese "alang-alang" roof.